Dylan Sinn | The Journal Gazette Notre Dame and Michigan fans gather on the set of College Gameday on Saturday morning, some of them having camped out all night, to see ESPN's popular pregame show. SOUTH BEND – Notre Dame was the site of the first “College Gameday” road show in 1993, when the No. 2 Irish took on No. 1 Florida State. A quarter-century later, ESPN's popular pregame show staged its season premiere in South Bend, its first trip to the campus in six years. Thousands of mostly green-clad fans packed the area just outside of the stadium's tunnel Saturday and roared their approval when the guest game-picker, country music star Luke Bryan, chose Notre Dame to beat Michigan. “It feels like church today, baby,” Bryan yelled, waving his arms at the crowd. The crowd got even louder when host Lee Corso stumbled on stage, bent over at the waist in a costume meant to make him resemble Quasimodo. Corso then removed the hood of his costume, donned a green hat and began dancing a jig with the Irish mascot. “The Hunchback of Notre Dame picks the Irish,” he said. 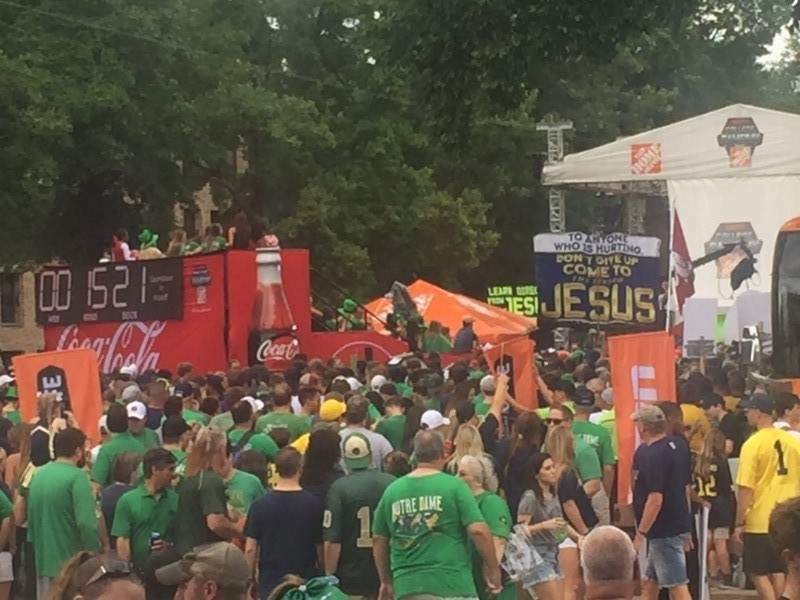 Notre Dame has been one of the most frequent guests on “College Gameday,” taking part in the show's Game of the Week 28 times prior to Saturday, including eight times in South Bend. The Irish compiled a 12-16 record in those games. Saturday's clash against the Wolverines was the seventh time the matchup between those traditional rivals has been the show's featured game. Among the crowd assembled behind the show's set were two Notre Dame fans from Fort Wayne, Justin and Chad Hunter. The brothers arrived late Friday and decided to save money by sleeping outside on the grass near the set instead of paying for a hotel. The pair wore bright orange hats made to look like construction helmets, which “Gameday” producers gave out to fans in the first few rows behind the set. Justin held a homemade sign that read, “Rivals beat the khakis off Harbaugh,” with the word “Rival” written in Ohio State's scarlet and the 's' on the end of the word stylized to look like Michigan State's logo. The sign, which Hunter sheepishly admitted took him about two hours to make because he isn't artistic, made it on to ESPN among the dozens of others fans enthusiastically wave behind the hosts' heads. The Hunters attended the previous “College Gameday” in South Bend, when the 2012 Irish beat Stanford 20-13 in overtime. Justin Hunter said the crowd Saturday, when the game kicked off at 7:30 p.m., was much larger than the attendance in 2012 for a game that started at 3:30. Chad, 22, and Justin, attended the game with their parents, who arrived in South Bend later in the day. They each picked Notre Dame to win by 10 points and then melted back into the excited crowd, which would see a 24-17 Irish victory.